MSAJ, which is designated as a type conformity certification organization by MLIT (Designation No. : MLIT No. 8), started the type conformity certification service based on the Building Standards Act on January 9, 2009. This service assesses a type of membrane structure building or a type of building that contains the membrane structure, which is to be mass produced, with respect to that type’s conformity to the building standards based on the Building Standards Act, and then certifies the type. 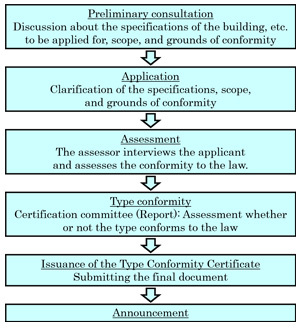 The building confirmation assessment and intermediate inspection for individual building can be simplified if the type of the building has been certified for type conformity. The assessment service proceeds as follows. If you have any question about this service, please feel free to ask our staff.